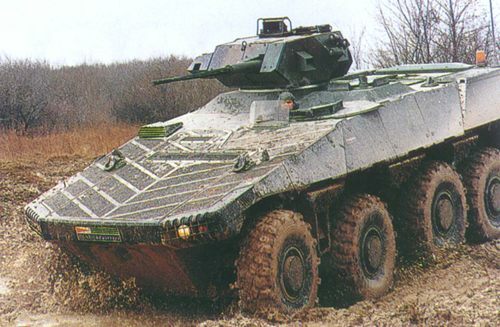 The VEXTRA is a former 8×8 wheeled Armoured Fighting Vehicle developed by the former French Defence manufacturer Giat Industries (now NEXTER). 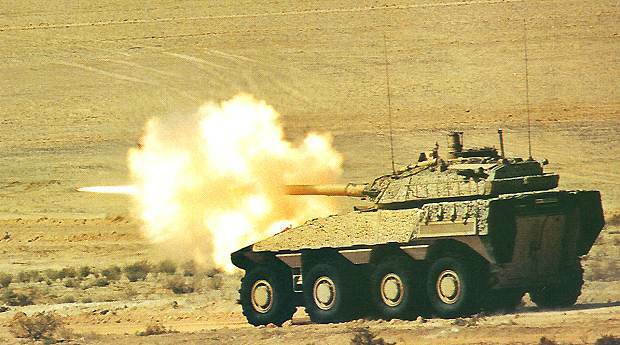 First unveiled to the export market in 1994 it was trialled in the United Arab Emirates as a reconnaissance/tank destroyer during 1997, but failed to attract any orders. The vehicle is no longer marketed on the NEXTER official website. The vehicle was initially fitted with a Dragar one-man turret mounting a 25mm chain gun and a 7.62mm coaxial MG in 1994. In 1997 this was replaced with Giat’s own three man TML 105 turret mounting a G2 105mm rifled main gun, which completed firing trials in France. The turret was later upgraded with a new multi channel (day & night) stabilised gunners sight, with laser range finder and SAGEM Savan 15 three-axis stabilization system to the main gun allowing it to engage targets successfully whilst on the move. Giat also had proposed a family of variants based on the vehicle, which included an Infantry Fighting Vehicle capable of carrying 8 troops. Like the majority of reconnaissance vehicles, the VEXTRA was constructed of aluminium so that it weighted less and improved its mobility. The aluminium armour was rated to withstand 14.5mm rounds & artillery splinters. Additional modular armour could be added if required. Its hull underbelly was countered much like a tank to give better resistance to anti-tank mines and smoke screens could be laid using the 80mm smoke grenade launchers.